17 days, 123 bouts and 17 matches later the big final is about to commence and bring down the curtains on a glorious tournament when the Haryana Hammers will square up against favourites and 2-time defending champions Punjab Royals at the Gautam Buddha University Indoor Stadium in Greater Noida. The tournament has been full of surprises, shocks and intense bouts and the final match promises to be perfect climax to the tournament. 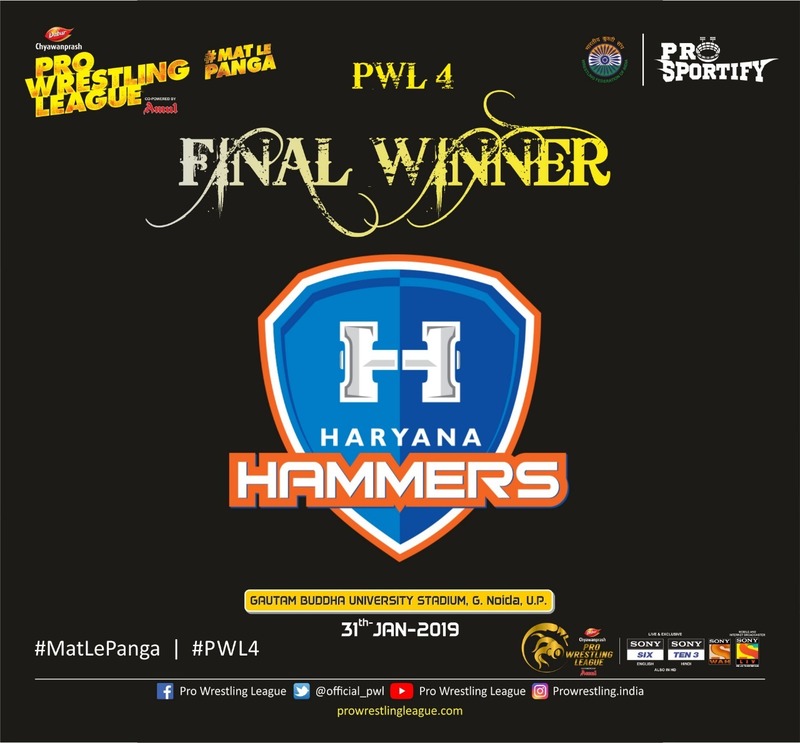 Haryana Hammers has carried a wretched record when it comes to finals as they have qualified for each and every one of the finals since the inception of the league and has failed to win any of them. This season they came in 2nd in the group phase and then comfortably saw off the Delhi Sultans’ challenge in the semis to set up a rematch of the finals of the last 2 seasons and will be hoping that they manage to secure a victory this time. Punjab Royals topped the charts in the league phase winning 4 out of their 5 matches and then beat UP Dangal in the semis as they continued their charge for a hat-trick of titles. Bajrang Punia has been a source of inspiration for the Royals and will be looking to finish off on a high. The bouts to watch out for include Ali Shabanov vs Dato Marsagishvili, Korey Jarvis vs Khotsianivski Aleksander, Bajrang Punia vs Rajneesh. Punjab Royals' players receive the silver medal for their amazing journey in this year's campaign but they were unable to add to their 2 titles. Kiran wins the Player of the match award for her amazing performance against Cynthia Vescan. No scores to show for the wrestler's efforts in this match. Tatyana takes a 5 point lead as the round draws to a conclusion with the final bout of the night and this season remaining. A fiery start as Rana tries to convert an attack from Dhankar but Dhankar takes a 2-point lead. Rana equalises with a good move. Dhankar pushes Rana to take a narrow 1 point lead as the round winds up. Parveen Rana will lock horns with Amit Dhankar in the men's 74 Kg category in the 7th bout of the night as Haryana Hammers lead by 5-1 with 3 bouts remaining. Bajrang is comfortable in this bout as he gains 1 more point which he increases by 3 points to take his lead to 11 points. Bajrang wins the bout by a score of 11-0 as Haryana's lead is reduced to 5-1. Hristova showing some fight for Punjab and wins 4 points as she takes the lead but Nichita comes back to score 2 points. Anastasia completes a pinfall Mimi and finishes off the match with a whole round remaining in the bout. 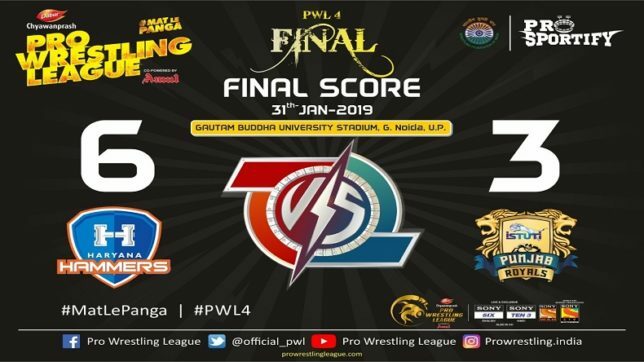 Haryana take an unassailable 5-0 lead and will be the champions of PWL 4. Both the wrestlers are attacking strongly. Ravi takes a 1 point lead which he is able to extend to 2-0 as the round ends and Haryana are steaming towards the victory. A probing first half of this 1st round as no points are scored. Kiran leads by 1 point as the final 30 seconds of the round remains. Kiran extends her lead to 3 points as the round ends. Both the wrestlers are trying to attack each other. Dato gains the first 2 points of the round and trying to bring Punjab back into this match. Dato leads 2-0 after the first round. Ali Shabanov will look to carry on his fine form as he prepares to face the consistent Dato Marsagishvili in the 2nd bout of the night as Haryana lead 1-0. A slow start to the match as both the grapplers are cautious. Aleksander pushes out Jarvis to gain 2 points and finish the round with that. Aleksander leads 2-0 ahead of the 2nd round. Korey Jarvis will face Khotsianivski Aleksander in the 1st bout of the night as the big final gets underway in Greater Noida.